WBO middleweight champion Billy Joe Saunders and his promoter Frank Warren have revealed they won’t be waiting around for the Gennady Golovkin-Canelo Alvarez rivalry to play out as they outlined their plans for the next 12 months. At 28-years-old the 26-0 (12) southpaw from Hatfield in Hertfordshire, UK, is keen to capitalise on the momentum gained by his comprehensive 12-round points victory over Canadian knockout artist David Lemieux last December in the third defence of the middleweight title he won against Ireland’s Andy Lee two years earlier. 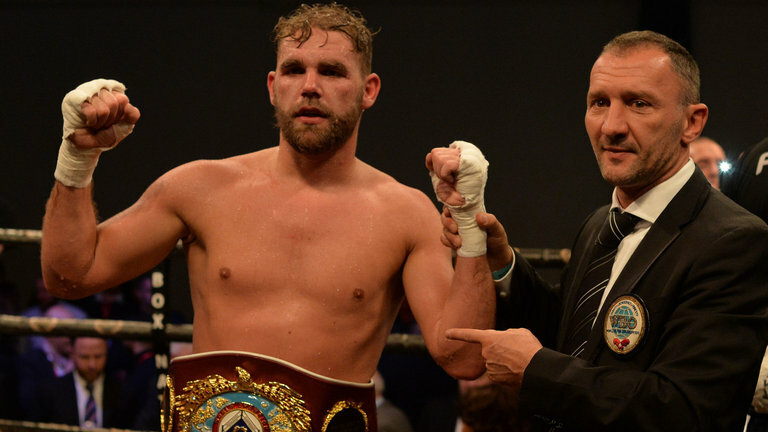 “I won’t be prepared to wait for nobody,” Saunders told Express Sport. “I’m doing my own thing now, whatever it is. Any middleweight out there or super-middleweight, I’ll be making waves to fight. His promoter Frank Warren has mapped out his plan for Saunders for the next year and it involves only fighting at home in what would be big domestic match-ups with international repercussions. “There’s two fights over here that I like for the winner coming through this [Saunders vs Murray] and that is James DeGale or a fight with [George] Groves,” the veteran promoter said. “I think they are more meaningful fights for the fans over here in the UK. Of course, those fights are there to be done. The 2012 London Olympic middleweight gold medallist Murata 14-1 (11) is a superstar in his native Japan and currently holds the WBA “regular” 160-pound title. But the priority opponent for Warren is current IBF super middleweight champion DeGale. “We would like to do that but obviously he [Saunders] has to get through this one first,” Warren continued. “But they are fights that would have been on the radar. First things first though. On June 23 at London’s O2 Arena Saunders had to get past four-time world title challenger Martin Murray 36-4-1 (17).